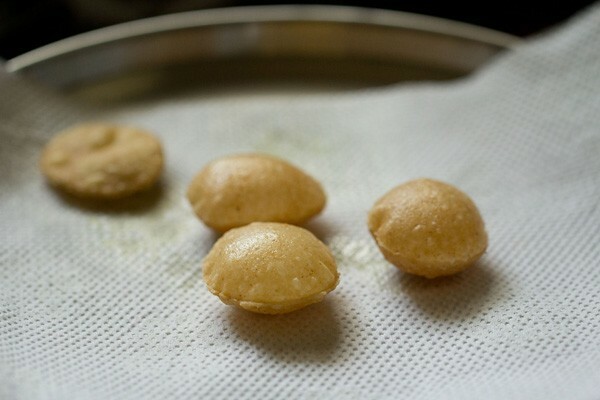 crispy fried puri or golgappa used for making pani poori, dahi poori, puchka and ragda poori. 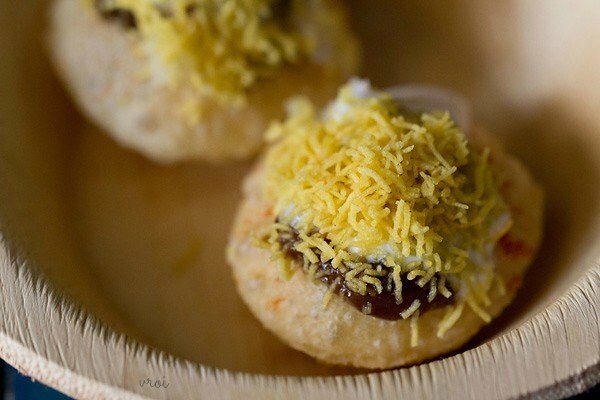 puri recipe for golgappa or pani puri or puchka with step by step photos – pani puri, as i call this awesome snack has always been a favorite since childhood. 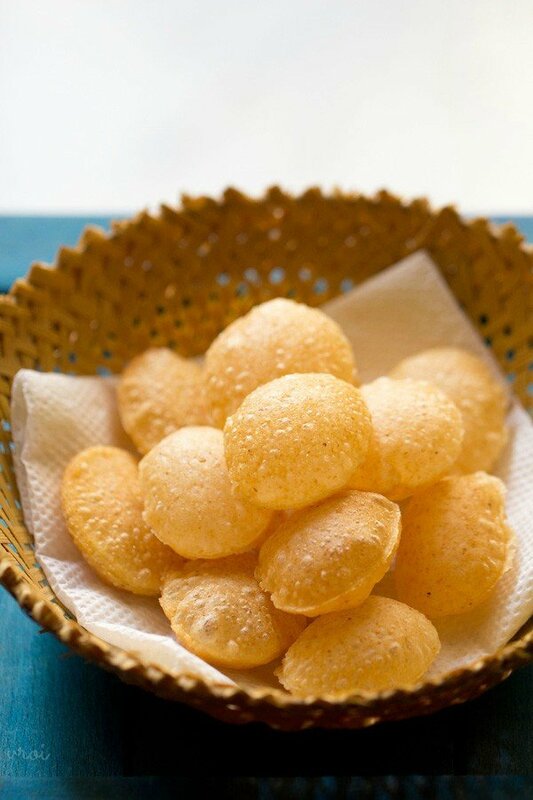 i remember me and my folks having pani poori from the pani puri wallah on the streets of mumbai many a times. i have even seen how the puris are made in bulk and then sold. 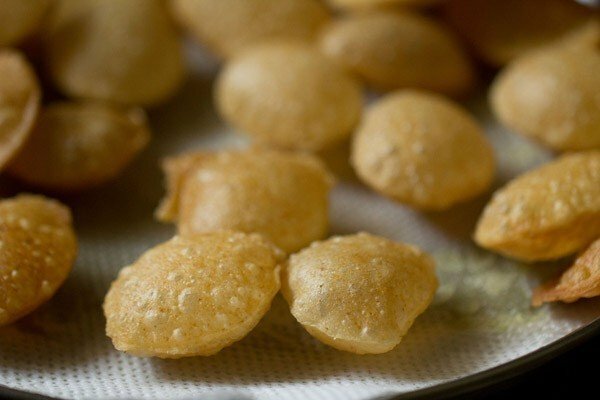 while as a kid, i used to think, how come the puri puffs so much and stays crisp. there was a family, close to my house who used to make these puris in bulk, pack them and then supply them to grocery stores. 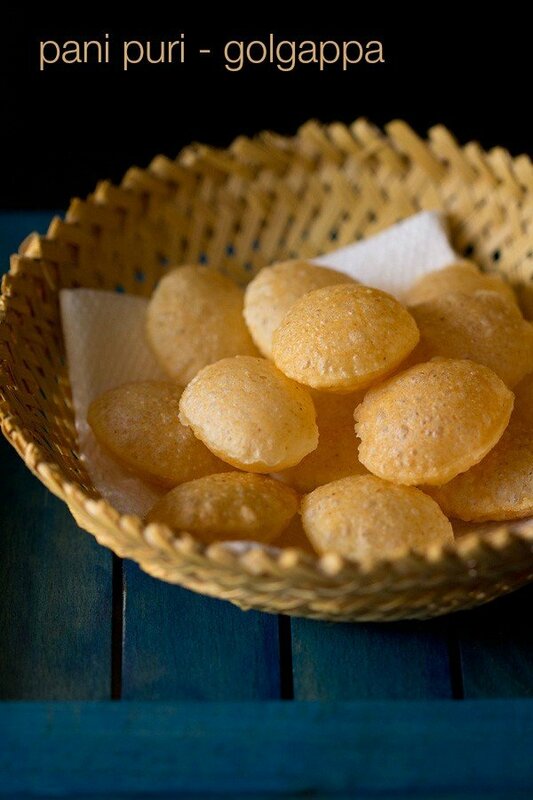 we are fond of these crisp puris, that most of the times we just have them plain. i have made these pooris many times. hence, i have updated this post with better pics and a lot of tips. i was getting many comments that the pani puri becomes soft after cooling down. when i make them, i never had this issue. i reasoned, that this problem is because the dough was not kneaded well and the poori roundels being thick. previously i has just mentioned to knead the dough well. but not emphasized that the dough also need to have elasticity in it. hence updated this post. i must say its easier to get a packet of ready made puris than to make them. its does take an effort to make these pooris. so prepare them, when you are free from any work. the perks of making puris at home is that fresh oil and ingredients are used to make the puri. plus no additives or preservatives are added and you know what goes into them. also they do taste better than the store brought ones. 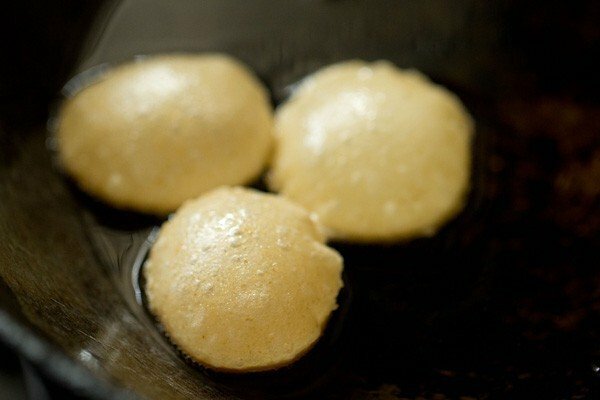 these pani puris can be made in large numbers and stored in an airtight container. this recipe yields 50 to 60 pooris. 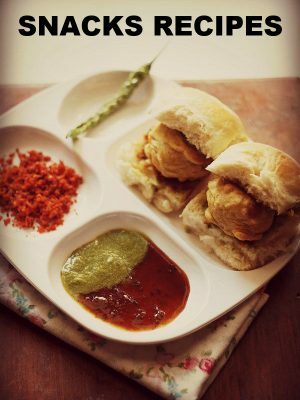 you could use the puris later to make pani puri or golgappa or ragda puri or puchka or dahi puri, just crumble and top it up on ragda patties, dahi papdi chaat, aloo chana chaat, sev puri, bhel puri or just have it plain. ensure that all the rolled puris are covered with a damp cloth. 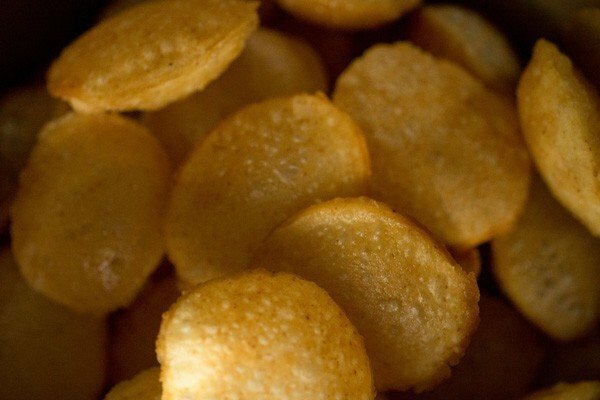 if the puris become dry, then the puris will not puff up. the above tips comes from experience. just before frying remove the damp cloth. you could fry 4 to 7 puris at a time. 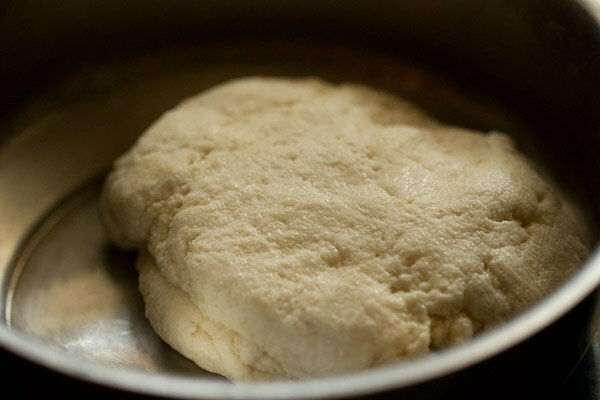 do not add oil to the dough while kneading as the puris will become soft later. the dough has to semi soft with gluten strands formed in them. there has to be elasticity in the dough. these factors give a crisp pani puri. the crispness stays even after the pooris are cooled and even later. 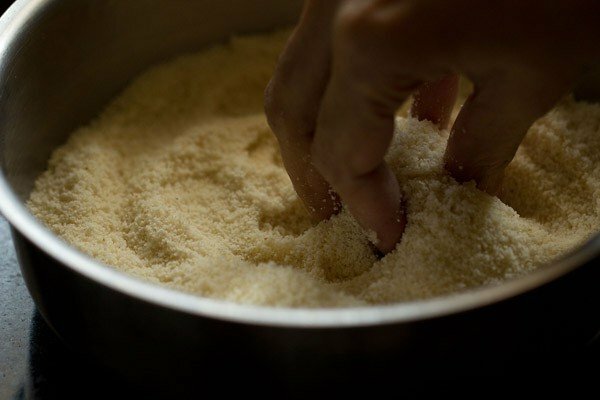 maida or refined/all purpose flour is used for binding the dough. avoid adding more maida to the dough. 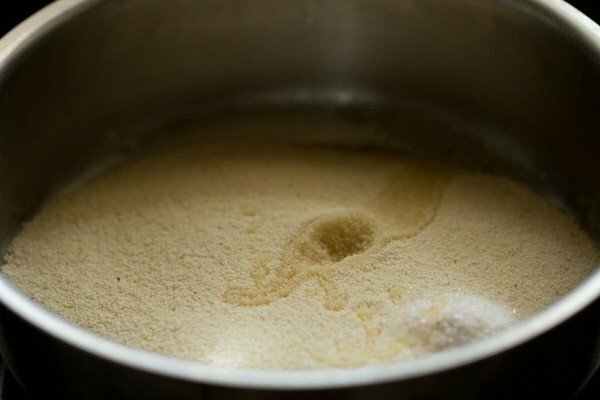 if the dough is not binding well, then you could add a few teaspoons more of maida. but don’t add too much. the puris have to be thin. if you do not roll them thinly, then the puris won’t puff up well and will remain soft from within. fry the puris in a moderately hot oil. 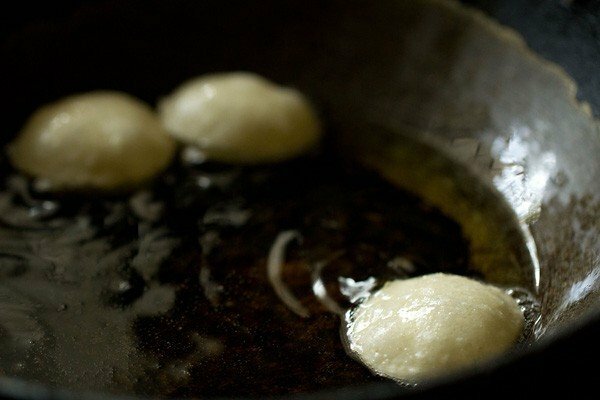 if the oil is not hot enough, the puris will absorb oil and become soaked in oil. too hot oil, will burn the puris. 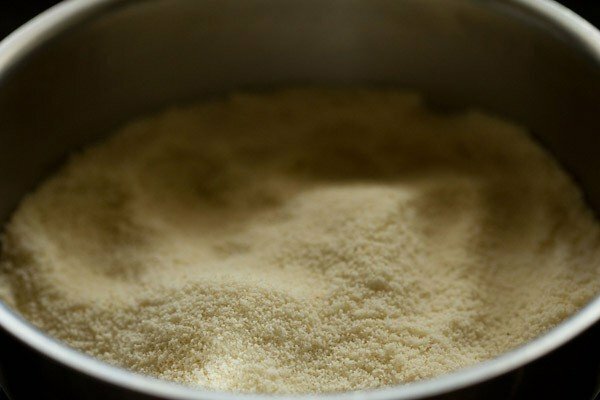 in a mixing bowl, take 1 cup fine unroasted sooji or rava or semolina (160 grams), 1 tsp oil, 3 to 4 pinches baking soda and 1/4 tsp salt. with your fingers, mix the oil evenly with the sooji. now add 1 tbsp maida/all purpose flour to this mixture. mix again very well so that the all purpose flour is mixed evenly. add 3 tbsp water first. mix again. then add 1 tbsp water more and begin to knead the dough. sooji absorbs water while kneading. add water in parts while kneading. then add 2 tbsp more of the water and continue to knead. the kneading is very important in getting the perfect pani poori texture. the dough is not soft nor too hard. if you make the dough soft, then add 1 to 3 tsp more of the sooji. if the dough looks hard, then add sprinkle some water and continue to knead. the pani puri dough should be elastic. gluten strands need to be formed, which gives a structure and shape to the pooris. 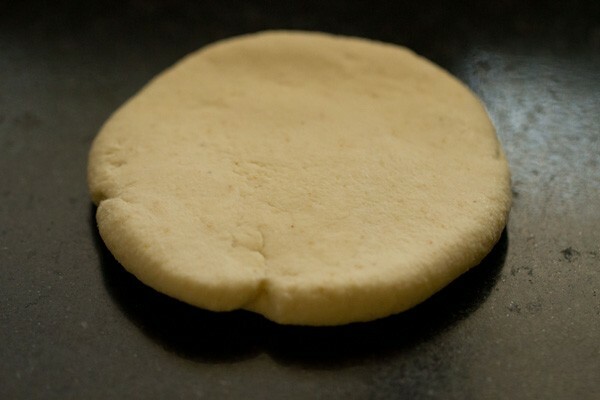 the correct texture of the dough, also help in puffing pooris and helps in them staying crisp. knead very well. elasticity helps in rolling the dough without an cracks and thinly. 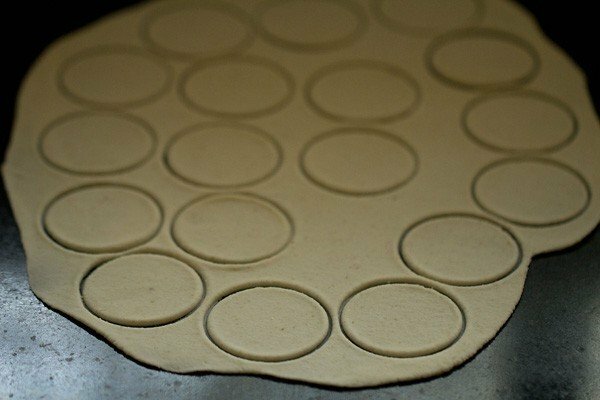 when rolling, the dough should roll easily without any cracks. 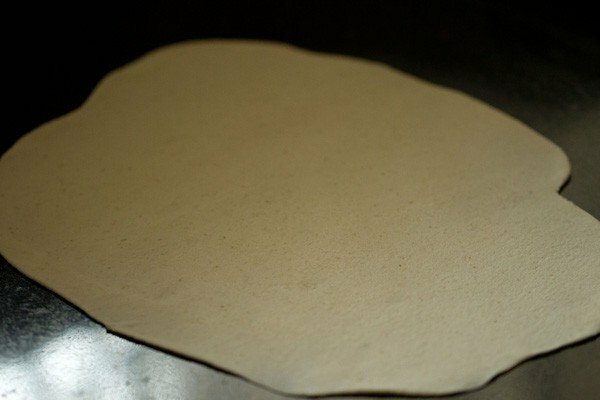 you should be easily be able to lift the rolled dough without it tearing or breaking and falling apart. 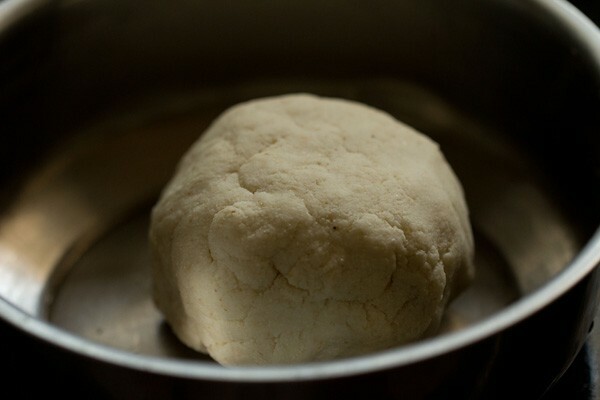 knead to a semi soft elastic dough and keep it in a bowl or pan. cover the dough with a moist kitchen towel or napkin and allow the dough to rest for 30 minutes. you can also keep the dough for an hour. 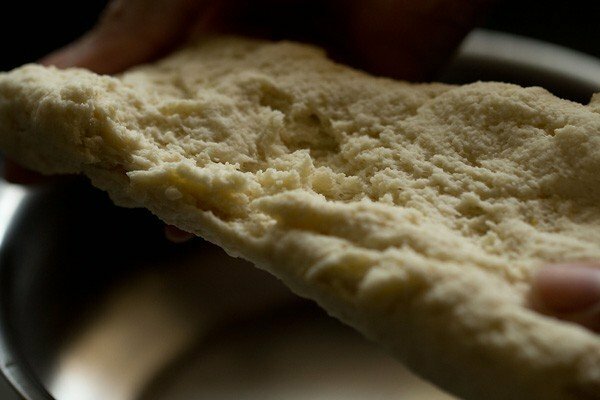 after 30 minutes, knead the dough again. now divide the dough into two or three parts. take one part on your work surface and begin to roll. 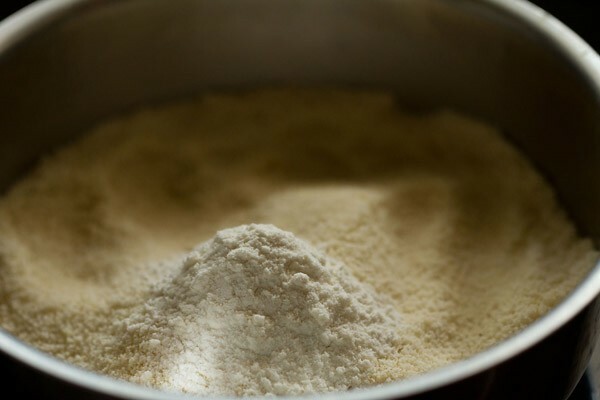 avoid adding any dry flour while kneading. keep the remaining dough covered with the moist kitchen towel. roll to a large round. there should be no cracks in the rolled dough. you can flip the entire rolled dough without it breaking or tearing apart. keep on rolling to a thin and even round. the pooris have to be thinly rolled. 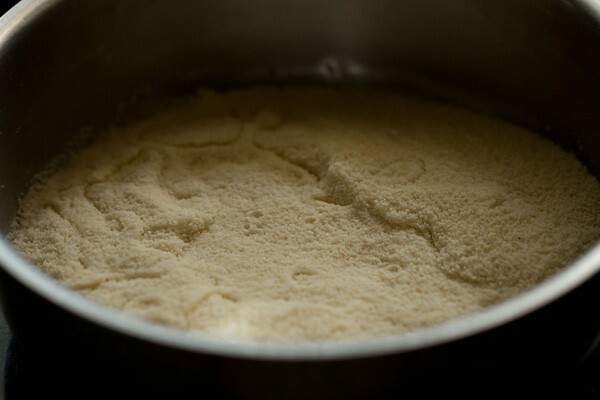 if not thin, the base becomes thick and remains soft even after frying. if the dough is not rolled evenly, then the pooris won't puff up. 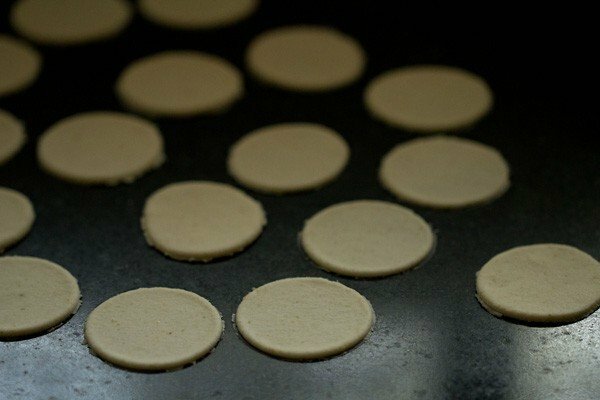 with a cookie cutter or a small bowl, cut small to medium discs from the rolled dough. using a cookie cutter gives even shape and size to the pooris. you can also make small balls and roll them. but then the pooris won't have an even and uniform shape. remove the dough edges and place the small roundels in a plate without them touching each other. keep these pooris covered with a moist kitchen towel. collect the egdes and knead them lightly. roll the edges too and make pooris the same way. in this way make all the pooris and keep them covered in a moist kitchen towel. you can also roll them and fry simultaneously like i have done. slid a few pooris in the oil. they will puff up quickly as soon as you add them to the hot oil. you can fry up to 4 to 8 pieces at a time, depending on the size of your pan. with a slotted spoon flip them, once they puff up. even after oil stops sizzling, continue to fry till light golden. frying this way, gives a crisp texture to the pooris from outside as well as inside. otherwise, they remain soft from inside and crisp from outside. fry them till they are a light golden or golden. 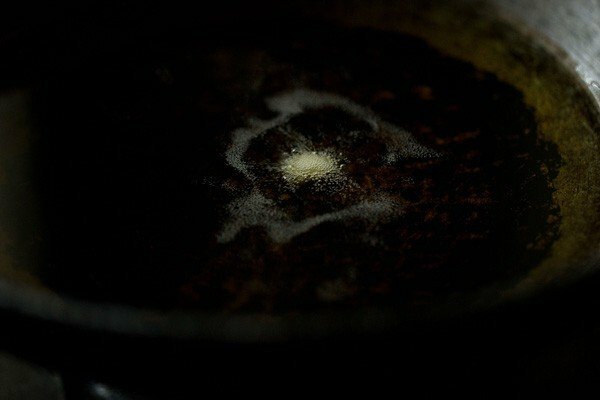 drain fried puri on kitchen paper towels. there will be a few flat puris too. 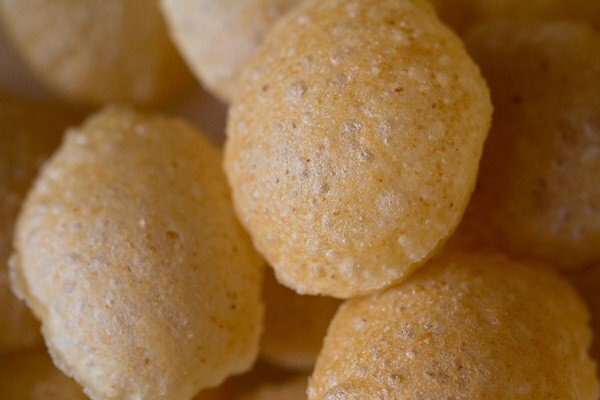 these you can use to make sev puri or papdi chaat. continue to fry all the pooris this way. once they get cooled at room temperature, immediately add puris to a jar or box and close the lid tightly. 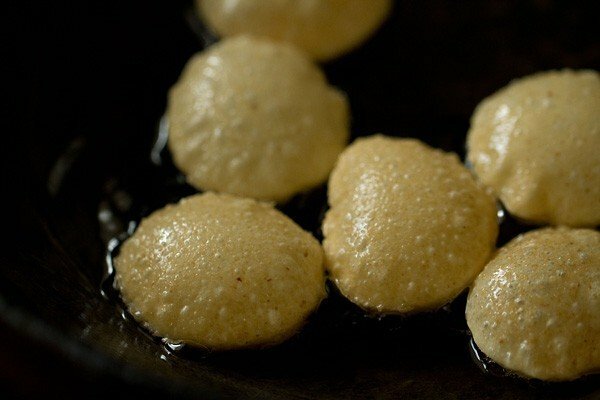 make pani puri, dahi puri or ragda puri or puchka from these homemade pooris or golgappas. you will get 50 to 60 pooris from this recipe. they stay crisp and good for a month if stored in an airtight box. 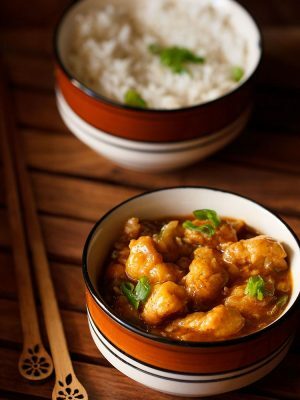 1. in a mixing bowl, take 1 cup fine unroasted sooji or rava or semolina (160 grams), 1 tsp oil, 3 to 4 pinches of baking soda and ¼ tsp salt. 2. with your fingers, mix the oil evenly with the sooji. 3. here’s the evenly mixed oil, sooji and salt mixture. 4. now add 1 tbsp maida/all purpose flour to this mixture. 5. mix again very well so that the all purpose flour is mixed evenly. 6. add 3 tbsp water first. 7. then add 1 tbsp water more and begin to knead the dough. sooji absorbs water while kneading. hence add water in parts while kneading. then add 2 tbsp more of the water and continue to knead. i added 6 tbsp of water. 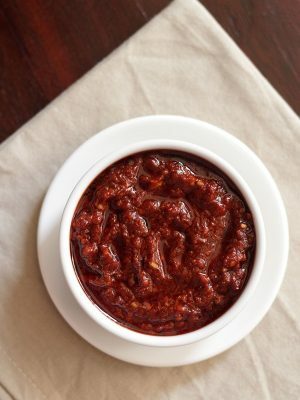 depending on the quality of sooji, you may need to add a bit less or more. the kneading is very important in getting the perfect pani poori texture. the dough is not soft nor too hard. 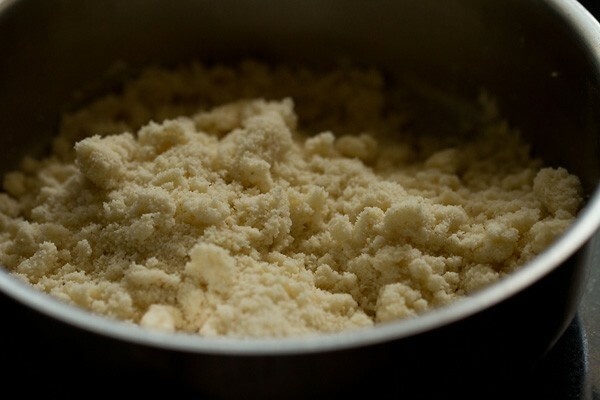 if you make the dough soft, then add 1 to 3 tsp more of the sooji. if the dough looks hard, then add sprinkle some water and continue to knead. 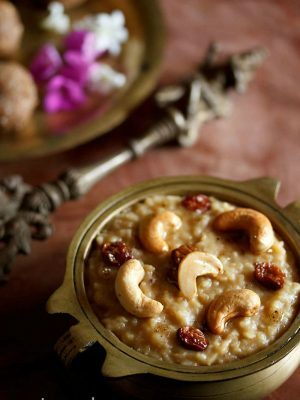 8. the pani puri dough should be elastic. gluten strands need to be formed, which gives structure and shape to the pooris. 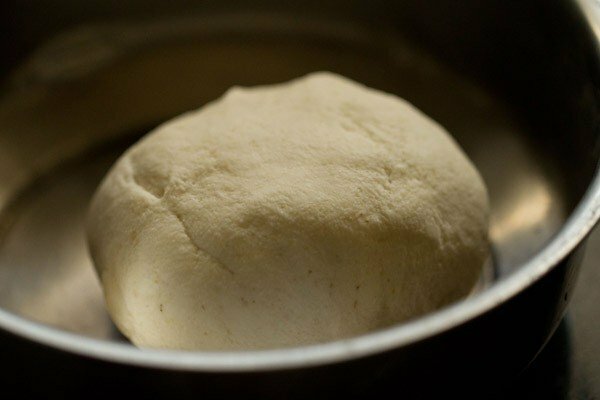 the correct texture of the dough, also help in puffing pooris and helps in them staying crisp. knead very well. elasticity helps in rolling dough without an cracks and thinly. when rolling, the dough should roll easily without any cracks. 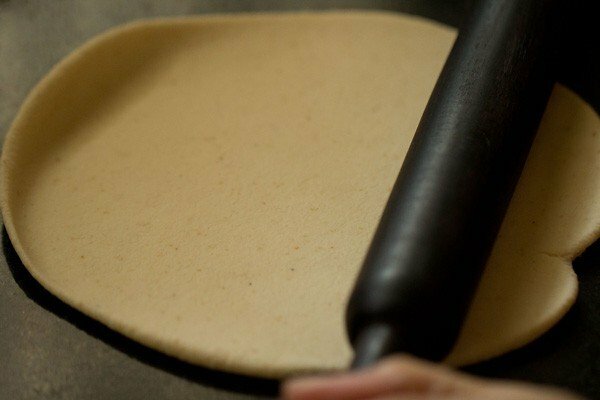 you should be easily be able to lift the rolled dough without it tearing or breaking and falling apart. 9. knead to a semi soft elastic dough. 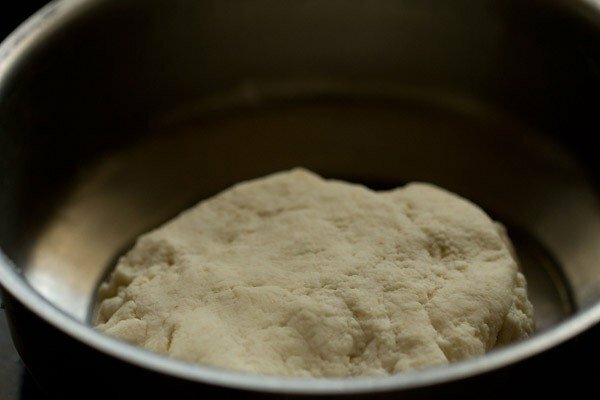 10. keep the well kneaded in a bowl or pan. 12. cover with a moist kitchen towel or napkin and allow the dough to rest for 30 minutes. 13. here’s the dough after 30 minutes. 15. now divide the dough into two or three parts. take one part on your work surface and begin to roll. 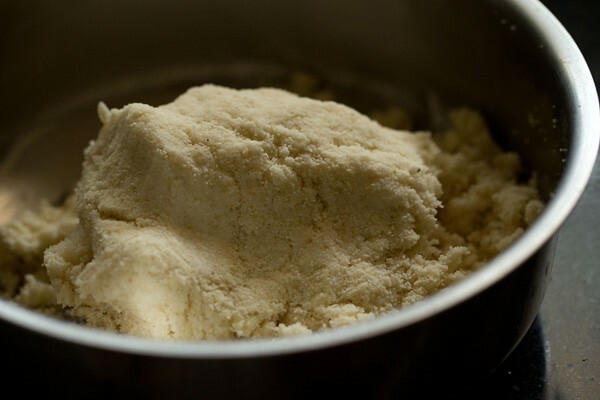 avoid adding any dry flour while kneading. 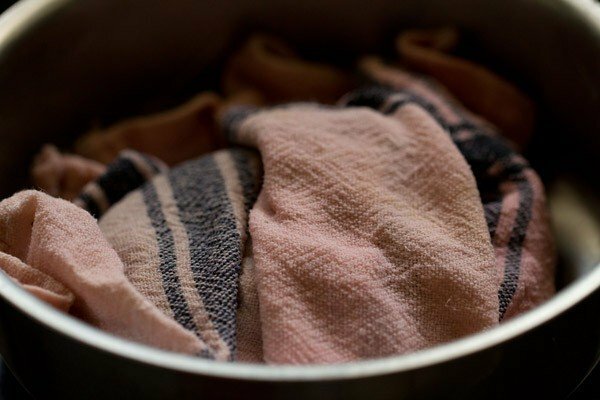 keep the remaining parts of the dough covered with the moist kitchen towel. 16. roll to a large round. you see there are no cracks in the rolled dough and the dough has a good elasticity. you can flip the entire rolled dough without it breaking or tearing apart. 17. keep on rolling to a thin and even round. the pooris have to be thinly rolled. 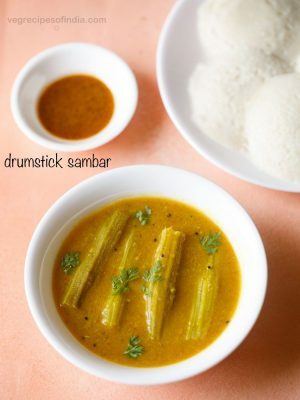 if not thin, the base becomes thick and remains soft even after frying. if the dough is not rolled evenly, then the pooris won’t puff up. 18. with a cookie cutter or a small bowl, cut small to medium discs from the rolled dough. using a cookie cutter gives even shape and size to the pooris. you can also make small balls and roll them. but then the pooris won’t have an even and uniform shape. 19. remove the dough edges and place the small roundels in a plate without them touching each other. keep these pooris covered with a moist kitchen towel. collect the edges and knead them lightly. roll the edges too and make pooris the same way. in this way make all the pooris and keep them covered in a moist kitchen towel. you can also roll them and fry simultaneously like i have done. 20. heat oil for deep frying in a kadai or pan. the oil should be medium hot. add a tiny piece of the dough ball in the hot oil. 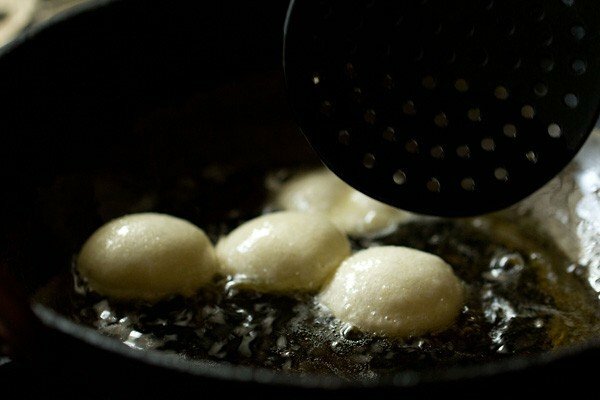 if the ball steadily comes up to the surface, the oil is hot and the pooris can be fried now. 21. slid a few pooris in the oil. 22. they will puff up quickly as soon as you add them to the hot oil. you can fry up to 4 to 8 pieces at a time, depending on the size of your pan. nudge the pooris with the frying spoon so that they puff up. 23. with a slotted spoon flip them, once they puff up. flip a couple of times. 24. even after oil stops sizzling, continue to fry the pooris till light golden or golden. even after they become golden, keep them in the oil getting fried for a few seconds, so that they become crisp. frying this way, gives a crisp texture to the pooris from outside as well as inside. otherwise, they remain soft from inside and crisp from outside. 25. drain puris on kitchen paper towels. there will be a few flat puris too. these you can use to make sev puri, bhel puri, chana dal bhel puri or papdi chaat. 26. continue to fry the pooris this way. 27. drain puris on paper towels to remove excess oil. 28. once puris get cooled at room temperature, immediately add them to a jar or box and close the lid tightly. 29. a close up pic of the texture of the pooris. 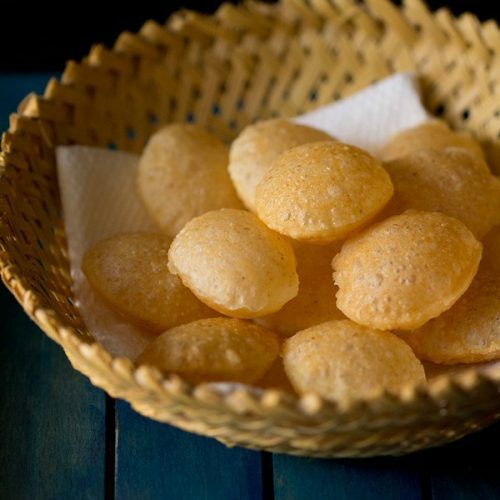 30. make pani puri, dahi puri or ragda puri from these homemade pooris or golgappas or puchka. 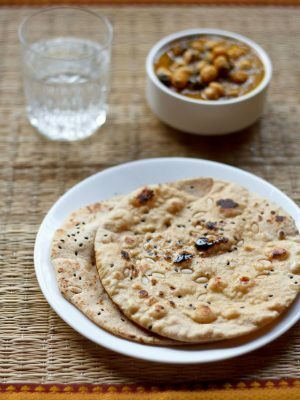 31. you will get 50 to 60 puris from this recipe. they stay crisp and good for a month if stored in airtight box or jar. Hi, could you also add a section on air frying these and what it would take to do that? I love all your recipes and have tried many of them, but due to health reasons cannot eat deep fried stuff. amrita, i doubt if these pooris will work in an air fryer. otherwise, i would have added a note on that in the recipe. 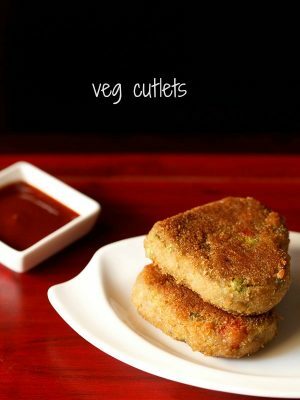 some recipes like samosa, french fries etc, which i have air fried – i have added notes on these in the recipe posts. Love it All! 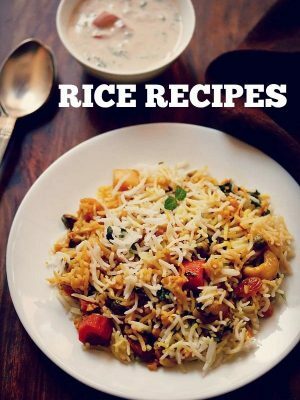 Im a pro chef and dont know much of my Father’s side of authentic Indian food to cook for my fiance! Awesome website! welcome rob and thank you. 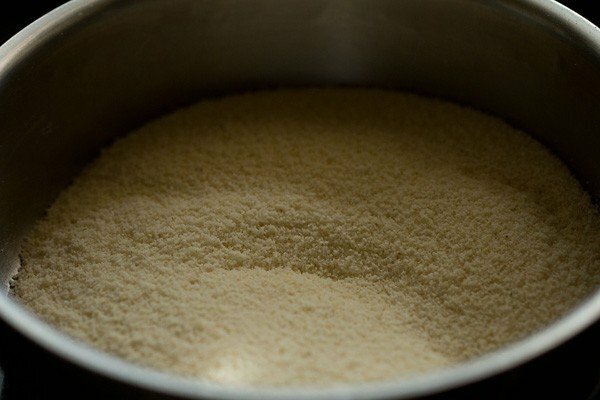 Can I use wheat flour instead of maida? I am not sure how the texture of puri will be if wheat flour is used. 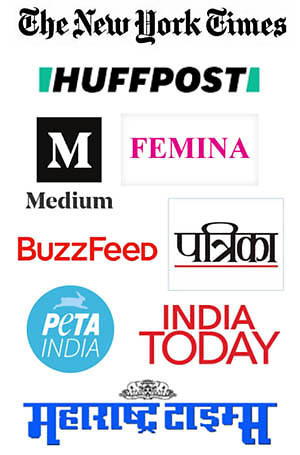 I found an article on pani puri which has different types of pani puri’s in India. Probably you might want to check to get ideas on recipes for any of these. thanks uma. i know about the different types of pani puri available in india. but not made them at home. i will definitely check these articles. can i substitute baking soda with baking powder..?! i would suggest to use baking soda. Not for me. I like paani ke bataashe [gol gappe] made from aata [wheat-flour] – neither from maida nor suzi nor anything else]. Can we skip baking soda? yashwiin, i won’t suggest. use the baking soda. You have mentioned serving size as 20-30,does it means the number of puris? I tried to make the pani puri as the instructions given here but I found a problem that the puries are puffing up but not getting crispy. I am using ground oil to fry at low temperature. Please guide me to correct this. on a low temp oil, the pooris won’t become crisp. fry on medium temp in the oil. also fry after the oil stops sizzling. this way you will get crisp pooris. removed your mobile number for security reasons. Thank you. I made these Puri today and i was successful. All thanks to you. I cook very confidential whenever I follow your recipe. Welcome Nanditha. Glad to know this. Thanks for sharing positive feedback on puri recipe. I tried and got it fluffy and crisp. Repeated the trial the next day. Still better! Kneading, and adding water little by little, is the key. Thanks Narayanan for your positive feedback and for sharing your experience. 1the dough has to be REALLY knead well for 8-10 mnts ,forget d teaspoon of water just applying a fee drops by dipping in water nd kneadding it. At first its very har but forms a ball but this is not d desired dough. Keep kneadding after some time it startd to crumble , add a few drops of water md keep kneadding after a few more mnts d dough becomes soft nd can be kept to rest. 2 Many ppl have written thayt it becomed chewy nd soft the reason i found was even after frying both sides it has to be kept in d oil for a few more seconds to make it crisp . Its turned up crispy nd tasy . thats great to know jaya 🙂 also thanks for sharing a detailed note on the kneading and frying part. it will sure help readers. you are right, the key here is to knead the dough really very well. it is hard at first, but then as you go on kneading it softens. 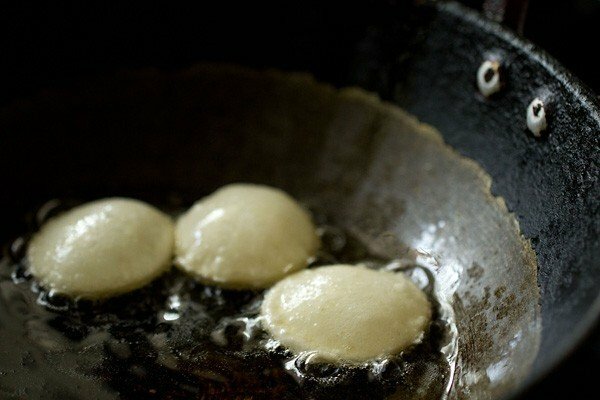 also after frying the poori has to kept in oil for sometime, so that they become crisp. i will add this point in more detail in the post. thanks again.